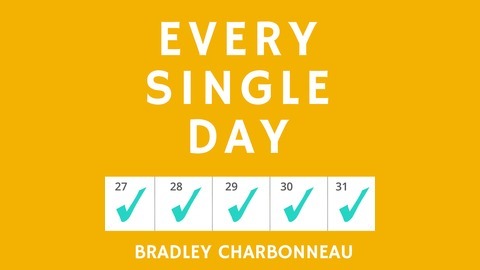 Author Bradley Charbonneau narrates his best-selling book "Every Single Day." 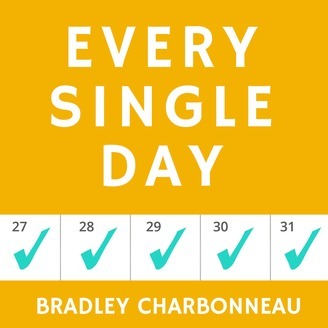 It's all right here in this podcast, shared weekly! From the foreword by John Muldoon. Maybe you've let your dreams rust. Maybe it feels like sh*t to even think about them. This book was written for you. I want you to know that it’s possible to change. It is possible to do things you can't imagine right now. I want you to do what it takes to be proud of yourself. I want you to stop waiting for inspiration or motivation because those things only come after you take action on something that matters to you. Use this book as a guide. Hell, don't wait to get started until after you've read it. Start now. The title is all you really need to know, but there is great value beneath the surface. Those pills on the cover, they are the prescription you are looking for. But the true value isn’t even about what you think it’s about--there’s a secret that reveals itself as you dig deeper. It’s about the courage and pride you earn by being consistent with something that’s hard at first. This is the medicine you take for the side effects. If there's something you really want to do or become, just start doing it. You can create amazing art, exercise your body to become stronger and more fit, build a great business or relationship, or hone a skill to the point of mastery. You just have to start doing it. Do it every single day until it becomes a part of you that won't go away. It's really that simple. You just have to decide. Make today the day you look back on with pride and say, “That was the day that it all began.” We are all rooting for you. -- John Muldoon, September 2017, San Francisco, CA. When you create, you can refer to what you have created. Get out there. In the cold. Put on your jacket. Do your thing. Here’s the episode from Spark Campfire.